The government today found itself at the receiving end on the proposed Value Added Taxation regime as BJP and Shiv Sena members joined a vociferous Opposition in the Lok Sabha demanding the withdrawal of the VAT regime. The Punjab Goverment’s move to diversify crops through contract farming received a boost today when Mr Rajan Nanda, Chairman, Escorts Limited, and Mr P.K. Verma, Chairman, the Punjab Agro Industries Corporation, and Financial Commissioner, Development, signed an MoU in this regard. 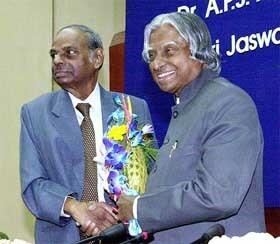 President APJ Abdul Kalam being presented with a bouquet by Dr C. Rangarajan, Chairman of the XII Finance Commission, during the golden jubilee celebration of the Finance Commission of India in New Delhi on Wednesday. The Centre today decided to appeal in the Supreme Court against the directive of the Telecom Dispute Settlement and Apellate Authority to submit the files pertaining the correspondence between the Department of Telecommunication and the TRAI in which the former had argued against allowing basic operators to offer limited mobility services. Hope we are not stirring a hornet’s nest! Six rice mills imported rather hurriedly by the Punjab Markfed from Korea two years ago at a considerable cost have started showing positive results. The Punjab state warehouse field staff employees union are faced with a peculiar situation. They are opposed to recovery being effected from them for “shortages” of rice and paddy stocks in the premises of rice mills. Honda Motorcycle and Scooter India said today it would invest about Rs 300 crore to boost production capacity to 7.5 lakh units over the next three years. The company, which currently makes scooters, would also foray into the domestic motor cycle market next year, its President and CEO Haruo Takiguchi told reporters after the unveiling of a new 150cc geared scooter Eterno here. Mr Gautam Thapar and Mr Rakesh Bharti Mittal have been elected as Chairman and Deputy Chairman, respectively, of the Confederation of Indian Industry (Northern Region) for the year 2003-2004. The newly elected Council of CII (NR) met yesterday at the close of the 29th Annual Session in New Delhi. Milk plant Verka would introduce fortified milk in the holy city on eve of Baisakhi. The Haryana Industries Department proposes to acquire almost 700 acres of land in scattered pockets in Gurgaon. An industrial estate is proposed to be set up here by the HSIDC. The apex committee for clearance of project proposals for setting up medium and large industrial units in Jammu and Kashmir, has given a green signal to 31 projects, to be set up in the state. Air-India has decided to further curtail its services to Hong Kong following a drop in the loads due to the Severe Acute Respiratory Syndrome scare as well as a directive from the Indian Pilots Guild asking line pilots not to operate on this sector. The government today found itself at the receiving end on the proposed Value Added Taxation (VAT) regime as BJP and Shiv Sena members joined a vociferous Opposition in the Lok Sabha demanding the withdrawal of the VAT regime. They also demanded that the excise duty exemption on readymade garments be restored. Raising the issue during the Zero Hour, Samajwadi Party (SP) leader Mulayam Singh Yadav said that the introduction of the VAT regime will open the floodgates for imported goods to India and will seriously affect small business enterprises. Expressing dissatisfaction over the reply given by Union Textiles Minister Kanshi Ram Rana that he would convey the feelings of the members to Finance Minister Jaswant Singh, Opposition members from several parties shouted slogans such as “VAT wapas lo (withdrawal of VAT)”. 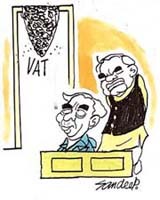 BJP leader Madan Lal Khurana said that “Delhi will never accept VAT”. “I have always been against it ( VAT). It will hit the traders of the Capital badly”, Mr Khurana said. SP leader M.S. Yadav termed the proposed VAT regime as “draconian” and said that “small traders in the textile sector will not be able to pay the tax. Natural justice will not be given to those who need it the most”. Congress Chief Whip P.R. Dasmunsi said that the Parliamentary Standing Committee on Finance should have an indepth look at the matter including rationalisation of the tax collection policy. “A law should be made to prevent harassment of small traders and the operation of VAT be kept in abeyance till then”, Mr Dasmunsi said. Shiv Sena leader Chandrakant Khaire pointed out that the imposition of 8 per cent excise duty on readymade garments as announced in the Union Budget will seriously affect the businesses of small scale garment manufacturers. Jaishree Banerjee of the BJP echoed similar views and said that the small and cottage industry will be adversely affected if excise duty exemption was not restored. Earlier Speaker Manohar Joshi disallowed adjournment notices moved by several Opposition members on the proposed VAT regime. The Opposition parties had demanded the suspension of the Question Hour to discuss the VAT issue, but was rejected by the Speaker. The agreement was signed in the presence of Capt Amarinder Singh and Ms Rajinder Kaur Bhattal, Minister of Rural Development & Panchayats, Agriculture. Later talking to mediapersons, Mr Nanda said Escorts would invest at least Rs 100 crore over the next three years to promote ‘‘high quality’’ basmati and other crops in the state. The company would provide quality seeds, fertilisers and other inputs to farmers and procure the produce at remunerative prices. The company would enter into contract with farmers to grow basmati and durum wheat on at least 50,000 acres in districts in Ludhiana, Moga, Sangrur, Muktsar, Faridkot and Bathinda in 2003-04. He said initially the company would handle purchase of basmati in bulk, but later the company would introduce its own brand in the market. According to the MoU, Escorts and the Punjab Agro would also jointly finalise the implementation of business plan to develop and instal a modern silo-based grain handling, storage and processing system for durum wheat as a collaborative measure. The state has already signed MoUs with Mahindra, UBI, Rallies India and Godrej Agrotech to grow winter maize, basmati, vegetables and fruits. An Indonesian firm has also expressed its desire to set up a chicken project with 60 units of 10,000 birds each in different parts of the state. The Centre today decided to appeal in the Supreme Court against the directive of the Telecom Dispute Settlement and Apellate Authority (TDSAT) to submit the files pertaining the correspondence between the Department of Telecommunication (DoT) and the TRAI in which the former had argued against allowing basic operators to offer limited mobility services. “We have no objection in showing any file to TDSAT. But we cannot show files fo business rivals”, Solicitor General and Government’s counsel Kirit Raval said. Mr Raval said that the government has decided to appeal in the Supreme Court against the Tribunal’s order. He, however, refused to divulge the exact date on which the appeal will be filed. “As early as possible”, Mr Raval said. TDSAT has fixed April 23 for issuing further directives. Counsel for the Cellular operators Gopal Jain said that it is an “issue of principles that documents which are relevant between the licensor and the licensee be placed before the Tribunal”. Mr Jain said it will help the Tribunal to understand the decision making process and pass further directions. The government has time between today and April 23 to appeal in the Supreme Court and secure a stay order. “If they do not get a stay order, the matter will be taken up at the TDSAT, which will issue further directions”, Mr Jain said. The mills were imported during 2001-2002 to augment the Markfed’s own paddy milling capacity. It was then argued that the Korean mills could give a rice yield of up to 67 per cent which was higher than the best yield of 62-63 per cent rice offered by the Indian mills. The mills were installed in Gidderbaha, Jaito, Goniana, Chuslewar, Naushehra Pannuan and Batala. But when the mills became operational, the rice recovery was much below the promised 67 per cent mark. It was just 48.49 per cent at Jaito, 44.73 per cent at Goniana, 46.50 per cent at Gidderbaha, 53.55 per cent at Batala, 38 per cent Chuslewar and 41.04 per cent at Naushehra Pannuan. It was, therefore, decided to carry out certain modifications in the rice mills keeping in view the Indian weather conditions and the quality of indigenous varieties. The results have been positive. The rice recovery has now increased to 63 per cent in Jaito, 61 per cent in Goniana, 60.50 per cent in Gidderbaha, 61.50 per cent in Batala, 54 per cent in Chuslewar and 59 per cent in Naushehra Pannuan. This has cut down the losses to just Rs 20 lakh and the Markfed authorities are confident that the mills start earning profit from next year. The Punjab state warehouse field staff employees union are faced with a peculiar situation. They are opposed to recovery being effected from them for “shortages” of rice and paddy stocks in the premises of rice mills. Their main grouse is that such a step initiated by the Managing Director was arbitrary and against the policy decision of the government. The Union President, Mr Akshar Kumar, told TNS today that the state government had ordered physical verification of wheat and paddy stock in 2002, which was stacked in godowns of the procurement agencies and premises of rice mills. The verification as done by the respective Sub-Divisional Magistrates. Paddy and rice stock worth Rs 121 crore was found “missing” from the premises of rice mills, whereas, wheat stock worth Rs 4.63 crore was found short. The government, he said, decided to proceed against the rice mills to recover the dues. Show cause notices were issued to the rice mills giving them 15 days time to pay up. In the case of wheat stock, the government had decided to proceed against officials concerned and supervisory staff. This decision was conveyed by the Director Food and Supplies to all procurement agencies on March 25. Mr Akshar Kumar says that not a single grain of wheat was found missing from the stocks held by the Punjab State Warehousing Corporation, while paddy and rice stock shortage worth Rs 30.28 crore was detected. As per the government decision, the corporation had issued 15-day notices to rice mills at fault and even vigilance cases were registered. The rice mills went to the court and the matter was sub-judice. The Corporation Managing Director, Mr Ashok Goyal, when contacted told TNS that each case was being enquired into on merit. Where it was substantiated that there was connivance of the employees with the rice mill disciplinary action was being taken and recoveries effected. This was being done to ensure accountability of the employees because the paddy stock held in rice mill premises was a joint responsibility of the mill owner and the corporation. “The responsibility of the corporation, however, is notional. Wherever it was found that the employees concerned were not at fault, no recoveries were being effected”. Honda Motorcycle and Scooter India (HMSI) said today it would invest about Rs 300 crore to boost production capacity to 7.5 lakh units over the next three years. The company, which currently makes scooters, would also foray into the domestic motor cycle market next year, its President and CEO Haruo Takiguchi told reporters after the unveiling of a new 150cc geared scooter Eterno here. A wholly-owned subsidiary of Honda Motor Co, HMSI produces the Activa and Dio scooter models at its plant at Manesar, Haryana, where it had invested Rs 300 crore till now. “We will invest an additional Rs 300 crore to increase production capacity from 4.5 lakh units in this fiscal to 7.5 lakh units by 2005-06,” he said. This fiscal, the company planned to sell 3.5 lakh scooters which would be increased to 7 lakh two-wheelers, including motor cycles by fiscal 2006. Takiguchi said HMSI would manufacture motor cycles between the 50cc to 250cc engine capacity at the existing plant. Mr Thapar is the Vice-Chairman and Managing Director of BILT (Ballarpur Industries Ltd). He is also the Managing Director of BILT Paper Holdings Limited, as well as Chairman/Director of various other companies. Mr Rakesh Bharti Mittal is the Vice-Chairman and Managing Director of Bharti Teletech. An electronics engineer, Mr Mittal has rich experience in managing evolving business operations and environments for over 26 years. A notification for acquisition of this land, surrounding the villages of Khandsa, Narsinghpur, Begumpura and Mohammadpur Khandsa of Gurgaon district, has already been issued. This has peeved over industrialists of Gurgaon who are already running over 400 industrial units here and have applied for change in land use (CLU) of several acres of land surrounding these units. The units involving a cost of Rs 311 crore will provide employment to nearly 2,000 persons, an official release said. Air-India has decided to further curtail its services to Hong Kong following a drop in the loads due to the Severe Acute Respiratory Syndrome (SARS) scare as well as a directive from the Indian Pilots Guild asking line pilots not to operate on this sector. Effective April 11, the airline will operate only two frequencies a week to Hong Kong with executive crew without involving a layover, an airline spokesman said here today. MANILA: Afghanistan, Pakistan and Turkmenistan have signed a joint letter formally inviting India to join a 1,600-km (990-mile) natural gas pipeline project, the ADB said on Wednesday. The oil and gas ministers of the three countries are meeting in Manila this week to thrash out logistics and funding details of the project, which is expected to take three years to build.